Businesses need to provide exceptional customer service today as the competition has become a lot tougher than it used to be. There are so many options for customers in every segment that making them stick to a particular brand or particular service provider would require genuine efforts from the vendor. For this very reason, businesses maintain a contact center or outsource their customer support work to Indian call centers. 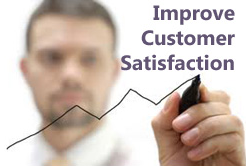 Here are some simple yet highly effective tips for improving customer satisfaction. These tips would in turn help in retaining customers and in earning their loyalty. Listen To Them And Learn From It: Every business would have a number of interactions with its customers. These conversations should be properly listened with genuine interest. You will find that there are many small things that can be easily worked out to enhance the customer satisfaction. Further, you should also take regular feedback from your customers and evaluate this feedback to get meaningful information out from it. Feedback should be made small and effective as people usually don’t like to spend too much time on feedbacks and surveys. Treat Them As You Expect To Be Treated: The best way to treat your customers is the way in which you would like to be treated by any service provider. Everybody uses some or the other services and products provided by various businesses and many times they have to communicate with the services provider. Business owners should keep themselves in the place of their customers and think how they would like to get treated. This would allow them to formulate a strategy that would help their agents in delivering enhanced call centers outsourcing services. Use Every Available Channel for Customer Services: Apart from the telephones, there are many more channels available for communication. Now-a-days, everybody is using online social platforms for communicating with their friends, family and even with businesses. Further, web chat and email are also there for communication. Organizations should try to have their presence in all these areas and should make themselves capable of providing customer support services through these mediums. Organizations need to understand that customers are now the most important entity in their business. It is necessary for them to keep these customers satisfied so that they don’t leave them and go to some other service provider. These tips would help businesses in improving customer satisfaction and retain them for long time. If you have any suggestions or would like to express your own thoughts on this topic then please leave us a comment below. Posted in Customer Retention, Customer Satisfaction and tagged Customer Services.